Cupping Gets Its Close-Up In Rio Olympics : Shots - Health News There's scant science to support the ancient Eastern therapy of cupping. But that hasn't stopped Olympians from trying it to ease pain and speed recovery. 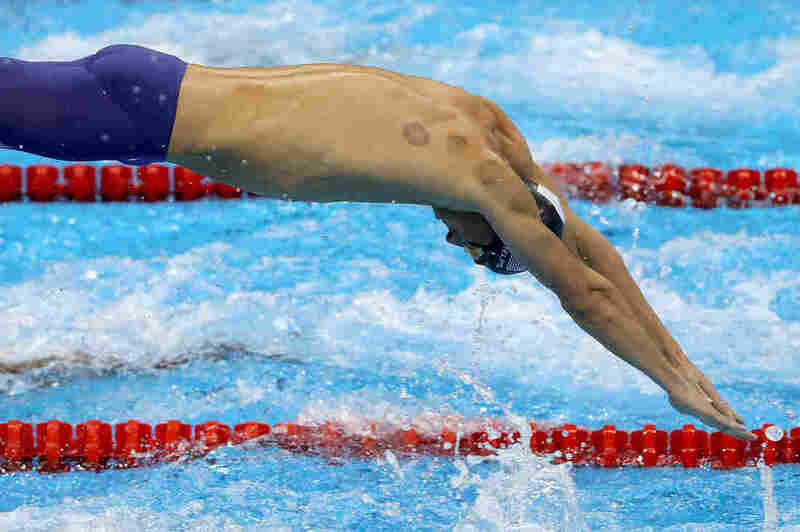 Michael Phelps shows signs of cupping on his way to another gold medal in Rio de Janeiro. Swimmer Michael Phelps won Olympic gold again Sunday while covered in red — red spots, roughly medal-size, all over his shoulders and back. The marks were the result of an ancient Eastern medicinal therapy known as cupping that is achieving new popularity among some athletes in the United States, including numerous Olympians. Cupping typically involves treating muscle pain and other ailments with cups that apply suction to skin. Cupping is often combined with other forms of alternative medicine, such as acupuncture and massage. "The practice itself is very old," says Karyn Farrar, a physical therapist at Rehab 2 Perform in Frederick, Md. "In the past five to 10 years it's becoming prominent in terms of physical therapists, athletic trainers and massage therapists [in the United States] using it more and more." Farrar's office treats five to 10 athletes — mostly high school and college students — with cupping each day. Farrar says cupping is like a reverse form of massage. Instead of applying pressure downward onto muscles, she says, "you're using negative pressure to pull soft tissues apart" from the suction of the cup. "As you're pulling, you're also getting increased blood flow to the tissues." She claims the practice decreases swelling in acute injuries and speeds up healing. The large red spots are caused by the bursting of small blood vessels near the skin. Farrar says she expects more athletes to ask about the treatment after seeing the very visible signs of its aftermath on some of this year's Olympians. According to Ted Kaptchuk, a professor of medicine at Harvard Medical School who is trained in Asian medicine, the cupping trend isn't exactly new in the U.S. Cupping has a long history in Western medicine and was commonly practiced by American physicians in the 18th and 19th centuries. But Kaptchuk says cupping fell from favor in the U.S. in the 1920s when practitioners of Western medicine began to see the practice as "old-fashioned," in part because of a lack of scientific evidence that it had a true healing effect. Today, while some studies have explored the effects of cupping, there is still scant scientific evidence supporting its healing potential. "We need rigorous research to understand whether there is a physiological effect associated with cupping and currently that is unknown," says David Shurtleff, deputy director of the National Institutes of Health's National Center for Complementary and Integrative Health. NCCIH currently doesn't fund research on cupping, partly because the studies are challenging to design. It is difficult to know whether a patient feels better after cupping because the treatment worked on a physical level or because the patient expected to feel better and so does — in other words, the placebo effect. But Shurtleff and Kaptchuk agree that a placebo effect from cupping could work to reduce pain with or without an underlying physical benefit. While there is still limited scientific evidence supporting cupping, Kaptchuk says that "what we do have, is that people feel better after it's done." For Olympians, that feeling may be just enough to help them on a trip to the medal podium.